This item has been discontinued. Please call us for an alternative suggestion, or view any of our other salt spreaders. Spreading salt by hand is a chore. It’s labor intensive and time-consuming - and that’s just for small walkways, When it comes to salting large driveways or expansive store fronts, it’s an absolute pain. 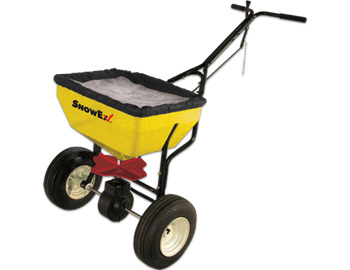 Capable of holding 100 lbs of salt, the SnowEx Walk Behind Spreader lets you salt your property without the hassle of expensive and complicated spreaders that require a truck. This salt-spreader is a no-fuss piece of engineering. The device is made with as few moving parts as possible to prevent wear and malfunction. This construction, combined with the the machine’s rust-proof powder-coated frame, keeps the spreader working after years of use. Backed by a 2-Year Warranty. We currently do not have any FAQs for the SnowEx Walk Behind Salt Spreader. If you have any questions, email us at [email protected]. The SnowEx Walk Behind Salt Spreader is backed by a 2-Year Warranty.